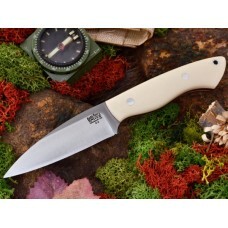 The Bush Seax Bantam is a slightly smaller version of the Bark River Saex that is built with user comfort in mind. With a slightly smaller handle than the original, users will find the handle to be more comfortable in a variety of grips. At 8.75” overall the Bush Seax Bantam is easier to carry on your belt as well. Just like the original, this knife has some serious cutting power and a historic design that dates back hundreds of years. The size and shape of this knife screams for use at home in the kitchen also thus adding to the utility of this fine blade. The Bark River Bush Seax Bantam has the original Kalahari style handle for maximum user comfort and comes with a 4.25” convex ground blade made of A2 tool steel (3.875" cutting edge) with 1.125" of blade height. A leather carry sheath makes carrying the knife easy and comfortable. Proudly made in the USA. Average weight approximately 5.6 ounces. 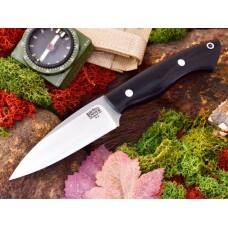 Bark River Bush Seax Bantam Black Canvas. 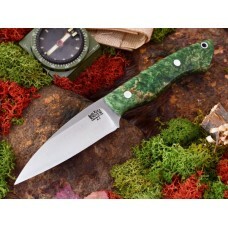 The New Bark River Bush Seax Bantam is a more compact ver..
Bark River Bush Seax Bantam Green and Gold Elder Burl. 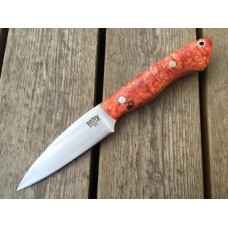 The New Bark River Bush Seax Bantam is a mor..
Bark River Bush Seax Bantam Red and Gold Elder Burl. The New Bark River Bush Seax Bantam is a more ..
Bark River Bush Seax Bantam Red Linen. 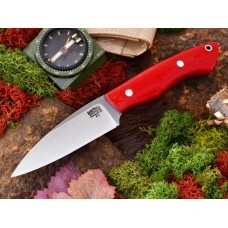 The New Bark River Bush Seax Bantam is a more compact versio..